Let’s get this straight. Bob Dylan is a musical legend, but his skills have certainly diminished over the years…and drug use. He is an iconic figure of musical intuition and perseverance, a man that is more of an idol than an actual living, breathing performer. So, when you get the chance to see him grace an audience with his presence, well, you go. And, go I did. On Wednesday Nov. 17, Dylan stopped at Binghamton University to instill in students, faculty and residents a quick lesson on how to rock and how to stay alive. The 69-year-old performer played a straight one hour and a half set of blues. I understand many virgin Dylan concert-goers went anticipating an acoustic guitar strapped around Dylan’s next with an harmonica in a sling attached to his mouth. They expected him to run through old favorites like “The Times They Are ‘A Changin.” But, that’s just not how he roles any longer. Please understand this folks and don’t be upset. Dylan changes music genres more than weather changes in Binghamton. He is now on a blues fix. If he continues to play, who knows, he may go back to playing “Lay Lady Lay” like he did in 2002. But, Wednesday night saw Dylan and his excellent band (who all matched in grey suits…except for the rebellious drummer) truck through some blues music. Blues allows Dylan to concentrate a little more on the music. He was singing, yes, but no one could really understand his words. But, that’s okay, no one could understand him 40 years ago. 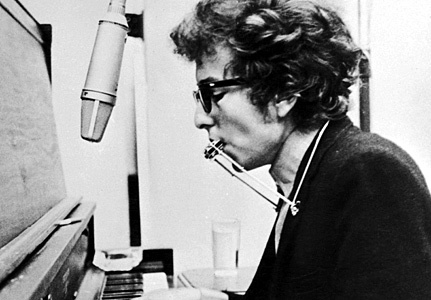 While Dylan’s guitar playing was dull, his keyboard playing was on par and he blew the harmonica with passion. Passion. The word of the night. 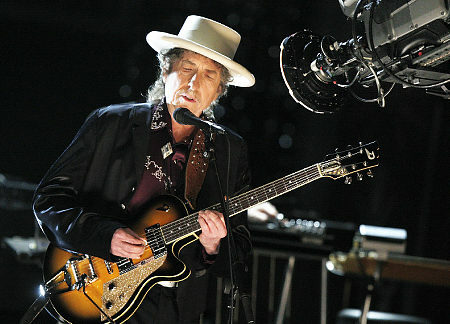 Dylan may be 69, but he was moving around stage with a youthful nimbleness that I did not expect to see. He swayed while he played the guitar and actively participated with his band when he was near them. When he was at the keyboard he was certainly more detached and he concentrated on the song at hand. But, a surprisingly energetic Dylan had the crowd of around 5000 tapping their feet and dancing. By God, it seemed like Dylan was enjoying himself. That is the reason why he continues to play. The man has plenty of cash. But, he loves performing. At the heart of his being is an entertainer and music has always been calling. It doesn’t matter what type. All that matters is that he can be on stage playing the music. That is respectable, and fans have to be excited that they can still see a living legend when he buses to their town to play a set. The highlight of the night was “Highway 61 Revisited.” My favorite Dylan song was played with enthusiasm and, while it may have been hard to follow him, I still sang along. And then came the encore with “Like A Rolling Stone.” He has transformed the song and the way it is sung, but, it was still fun to sing the chorus with a crowd full of people. Listen. Was he sharp the entire night? No. But, you go to a Dylan concert with a split mindset. You want to enjoy the concert, yes. But, you are seeing Bob Dylan. The name itself can almost make the show.